Filed under Be Careful What You Wish For, once again here’s our friend Euan Mearns, this time on how well-intentioned green initiatives may bankrupt and eviscerate entire nations. Euan’s site is Energy Matters. Euan Mearns: I last looked into the details and consequences of Scottish energy policy in the pre-referendum post Scotch on the ROCs. The expansion of Scottish renewables is progressing at breakneck speed and the purpose of this post is to update on where we are and where we are heading whether anyone likes it or not (Figure 1). Objections to wind power normally come from rural dwelling country folks whose lives are impacted by the construction of wind turbine power stations around them. My objections tend to be rooted more in the raison d’être for renewables (CO2 reduction), their cost, grid reliability and gross environmental impact. 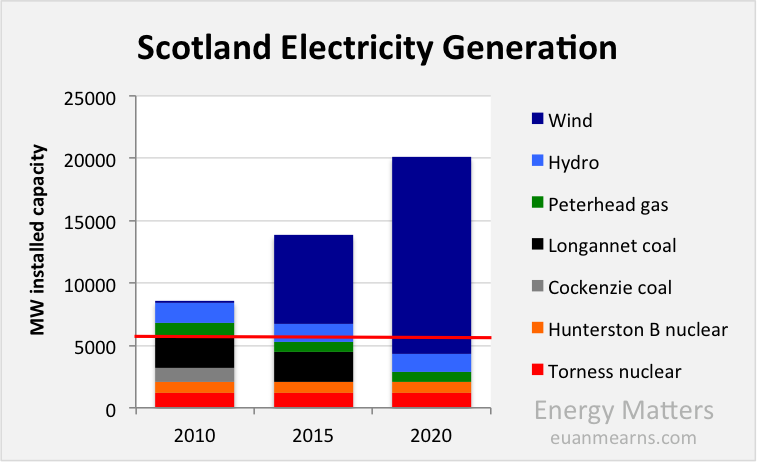 One issue I want to draw attention to is the vast electricity surplus that Scotland will produce on windy days in the years ahead. That surplus has to be paid for. Where will it go and how will it be used? Figure 1 The rapidly changing face of electricity generation in Scotland. Wind power seems destined to grow from virtually nothing in 2010 to 15.8 GW come 2020. Maximum power demand in Scotland is 6 GW (red line). This post was prompted by a couple of emails in the wake of my recent post on WWF Masters of Spin that brought my attention to two short reports prepared by Professor (emeritus) Jack Ponton that describe how operational and consented wind farms will already take Scotland beyond its 2020 target. The small pdfs can be downloaded here and here and the two key charts are reproduced below. Figure 2 The status of operational, consented and pending wind farms in Scotland as of August 2014. Figure 3 The status of operational, consented and pending wind farms in Scotland as of October 2014. 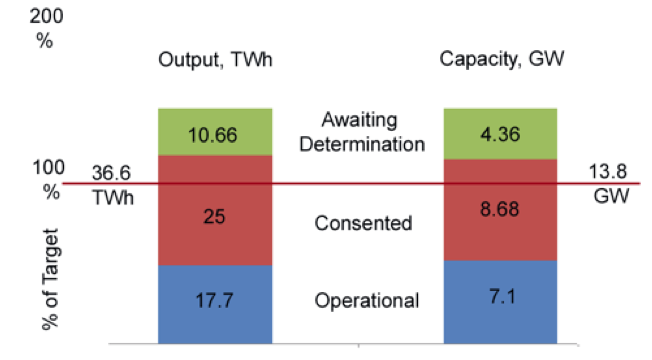 Figure 2 shows how in August 2014 operational and consented wind farms already had the capacity to meet the Scottish Government target of 100% electricity from renewables by 2020. Subsequent to that there has been a new round of wind power stations consented that takes us way beyond the target (Figure 3). So what is there to worry about? Figure 1 shows the status of Scottish electricity generating capacity in 2010, 2015 and 2020 (it’s reproduced below to ease inspection). There has been an astonishing transformation. By 2015 a major transformation has already taken place. Cockenzie coal fired power station has been closed. But we still have 6752 GW of dispatchable power, comfortably in excess of peak demand but susceptible to a nuclear outage. Peterhead gas now has a standby role with reduced capacity. Part of that power station may also be developed for carbon capture and storage (CCS). But the transformation is the expansion of wind to 7.1 GW, most of which is onshore. Flexible dispatchable power (coal+gas+hydro) totals 4.7 GW. Hence, when the wind blows hard we still have power to switch off and of course we have about 3.3 GW of interconnection with England. In 2010 we had 8.6 GW of generating capacity and today we have 13.9 GW generating capacity, that’s up 62%. The system is still safe and secure and expensive, testified by the fact that my lights are still on. 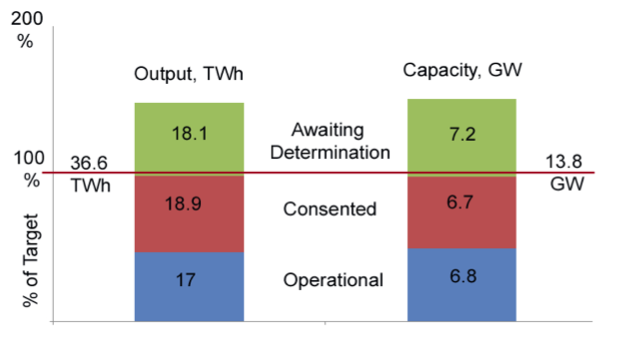 The 2020 configuration assumes that all the 8.68 GW already consented wind is built (Figure 3). The future of the Longannet coal fired power plant is currently being discussed by its owners and the Scottish Government. Given the massive over capacity that we already have, it seems likely it will close down. This is probably Scotland’s cheapest electricity supply. The two nuclear plants should still be operational. We will still have 4.4 GW of dispatchable power, 1.6 GW below the safe threshold. But 15.8 GW of wind operating above 9% capacity will cover that for most of the time, any shortfalls should be met by importing dispatchable power from England, but that will depend on how the capacity margin in England evolves. The reality will be that 2.07 GW of nuclear power will provide the stable system base load 24/7/365. When one of these plants is off line for scheduled or unscheduled maintenance we will be more heavily dependent upon imports. Unless of course Longannet coal is kept on permanent standby. The problem therefore in 2020 is not so much risk of blackouts but what will happen to the vast surplus of power we will produce when the wind blows hard as it has been doing in recent days. In the UK as a whole, peak demand is always around 6 pm on a week day in winter and minimum demand is always at night at the weekend in Summer (Figure 4). The minimum is about 38% of peak, in Scotland, roughly 2.3 GW. Night time summer demand for electricity, therefore, may be almost met by our two nuclear power stations. Figure 4 The pattern of UK electricity demand. Peak demand is always during a week day in winter at around 6 pm. Minimum demand is always at night during the weekend in Summer. At this point we need to remind ourselves about how the renewable merit order and subsidy system works. In short, the producers get paid their elevated guaranteed price regardless of whether or not there is demand for the power. According to Prof. Ponton’s calculation we are on schedule to produce 6.1 TWh annual surplus of wind power [17.7 TWh operational+25 TWh consented -36.6 TWh total annual demand =6.1 TWh wind surplus]. To this needs to be added approximately 16 TWh of nuclear and hydro giving us a total annual surplus of 22 TWh. How is this surplus going to be used? Plans are progressing to increase the interconnector capacity to England to 6 GW which is an interesting number since this is the same as Scotland’s peak demand. Part of “The Plan” is evidently for Scotland to export its surpluses. The snag is that when the wind blows hard it is often blowing hard in England and Europe too. At those times spot power prices are rock bottom and there is high chance that neighbouring countries will be gagging on surplus wind power at the same time. When the wind blows hard Scotland may be producing a 10 GW surplus that has nowhere to go. The Scottish Government often talks fondly of the hydrogen economy where surplus renewable electricity may be used to make hydrogen, normally by the electrolysis of water. The trouble with this, which is conveniently ignored, is that in making the hydrogen about 30% of the renewable energy input is lost, with a further 30% lost on energy recovery when the hydrogen is combusted or used in a fuel cell (estimates vary according to whether or not waste heat is recovered and used). Very quickly, 50% of the expensive subsidised and paid for wind power is lost. This is a short cut to bankrupting the country. Pumped hydro storage is a more feasible and scalable option and the Coire Glas scheme that has been approved but awaiting a final investment decision presents an ideal case study. In my post The Coire Glas pumped storage scheme – a massive but puny beast, I drew attention to how impotent Coire Glas would be in providing backup power to the UK. Let’s skin the cat another way at the Scottish scale. Coire Glas will have storage capacity of 30 GWh. How many times would it have to be filled and emptied to store the 22 TWh surplus that Scotland is shaping up to produce? With 50 hours generating capacity it is going to take about 1 week at optimum conditions to fill and then empty this massive beast. And so we are talking roughly 14 of these beasts (733 cycles / 52 weeks = 14.1 Coire Glas schemes required) to cope with the annual Scottish electricity surplus. This may sound feasible, but Coire Glas alone creates hydrology problems on the Lochs on the Great Glen that will act as the lower pumping reservoir. It is simply doubtful that Scotland will have 14 sites on the scale of Coire Glas that can each be filled and emptied 52 times each year without totally wrecking the hydrology of the lochs and river systems that are involved. If there is a concrete plan that shows how wind can be stored and delivered via pumped hydro storage then I’d like to see it. Another option for consuming this surplus is to reconfigure the nation’s heating requirements away from natural gas to electric heating. Norway for example uses cheap hydro electric power as its main source of domestic and industrial heat. It’s just a pity that wind is currently one of the most expensive forms of electrical power that we have. Overproduction of expensive energy is quite simply a bad idea. In 2010 Scotland had a self contained reliable diversified electricity supply system that created a dispatchable surplus that was exported to England. Come 2020 the Scottish system will be dominated by non-dispatchable wind power. When the wind does not blow Scotland will become an energy parasite dependent upon imports of dispatchable power from England, assuming that England has that dispatchable capacity to spare. When the wind blows hard, Scotland will generate a vast wind power surplus that will have low / no value and that no one will want / be able to use. The only way to make this plan remotely sensible is to deploy large scale pumped hydro storage. A detailed feasible plan for which, as far as I am aware, is lacking. The uncontrolled expansion of wind power that has effectively already caused a glut of non-dispatchable renewable electricity must surely undermine future development and deployment of marine renewables, some of which may have made more sense than wind. If you are objecting to wind turbine power stations being erected on your hill or glen, you should make clear in your objection that the wind power being generated is surplus to Scotland’s requirement. Some of it may be used at home, some of it will be exported and much of it may simply be wasted. It seems likely that Scotland’s beautiful landscape is being wrecked in pursuit of an ideological, empty dream. But GDP grew at 5% in Q3?! U.S. consumers have not turned out in force for the final shopping days before Christmas, suggesting that traditional retailers will just meet industry sales forecasts in a season marked by deep discounts and growing encroachment from online rivals led by Amazon. Super Saturday – the last pre-Christmas Saturday, which fell on Dec. 20 this year – failed to make up for spotty performance this season. That included a disappointing Black Friday, the day after the U.S. Thanksgiving holiday that is typically one of the busiest shopping days of the year. “The past weekend will not save this holiday season,” said Craig Johnson, president of the retail and consumer product-oriented private equity fund Customer Growth Partners. “But combined with online sales, it would certainly save the year from being a dismal one.” Johnson said if sales hold up in the next few days and the week after Christmas, retailers may finish close to his company’s November and December forecast of 3.4% growth in store and online sales. He estimates that Super Saturday weekend sales, which include store and online, rose 2.5% to $42 billion this year. The National Retail Federation (NRF), the leading industry trade body, forecast a 4.1% rise in holiday sales this year, including online and store sales. The NRF is hoping to meet its expectations amid falling gasoline prices, lower U.S. unemployment and consumer spending which showed signs of increasing during the first two weeks of December. Promotions heated up in the past five days but that did not boost store traffic materially, said Keith Jelinek, senior managing director of FTI Consulting. Most retailers offered an additional 20-30% off on top of 30-40% discounts on a wide range of products, Reuters found during a series of visits to three dozen stores in Chicago over the weekend. Analytics firm RetailNext, which tracks specialty stores and large footprint retailers, said sales dropped 8.9% over the weekend versus a year ago, and store traffic dipped 10.2%. However, customers who did hit the stores spent more. Specialty stores in the United States include chains like Best Buy and large footprint retailers include Wal-Mart and Target. “Even with this drop in growth, Super Saturday was still better compared to Black Friday,” said Shelley Kohan, vice president of retail consulting at RetailNext. “It generated a tad more in terms of sales on slightly less traffic.” Promotions earlier in November took a toll on in-store sales during the Thanksgiving weekend, when total spending fell by 11% from a year earlier. What a great time to increase imports! Oil futures plunged Wednesday on a government report showing a surge in supplies of U.S. oil and a record level of gasoline production. The U.S. is awash in oil, with record levels of production meeting a rising tide of imports. The U.S. Department of Energy said oil stocks rose by 7.26 million barrels, while analysts had expected a decline of 1.8 million barrels. West Texas Intermediate futures for February, already sliding, took another leg lower after the report, which also showed a 4.1 million barrel build in gasoline, more than six times the expected amount. WTI was off more than 3% to $55.40 per barrel, and Brent slid once more below $60 a barrel. “Refiners produced the highest amount of gasoline ever reported by the EIA — 9.92 million barrels per day,” noted Andrew Lipow, president of Lipow Oil Associates. He said refiners produced the second-highest amount of distillate fuel ever, at 5.24 million barrels per day, second only to 5.26 million barrels a day in December 2013. Refineries were also running at a high rate, with utilization at 93.5%. “To be able to build crude inventories like that in the face of a 93.5% utilization rate is remarkable. Imports are also rebounding,” said John Kilduff of Again Capital. He said imports of crude rose to 8.3 million barrels per day from 7.1 million the previous week. “Imports were much higher than the market expected, and we saw it in Gulf Coast inventories,” said Lipow. U.S. production slipped slightly to 9.13 million barrels a day from 9.14 million barrels a day. “If I had to guess (on the increase in imports), it was Saudi barrels headed for the Gulf Coast as part of their shock and awe,” said Kilduff. We have to doubt this. Or at least, there’s more to it. Airline profits are set to soar as oil prices remain suppressed when the big four are already flying high, aviation consultant and author Mark Gerchick told CNBC’s “Squawk Box” on Wednesday. “The bigger picture here is oil is turbocharging an industry that has already figured out how to make a profit at $100 a barrel of oil. It’s a boost, and it keeps on giving,” the former Department of Transportation official said. The cost of crude oil is down nearly 50% from highs touched in June. Prior to the plummet in oil, airline companies had already become more focused on their bottom lines as they sought to pack planes in a so-called process of “densification,” Gerchick said. The focus on the high-end business traveler and fare increases have also changed the revenue picture, he added. There are few signs of a price war, as the four major players in the market — American Airlines, Delta, United, and Southwest Air — have all said they will not add capacity, he said. Gerchick also see little chance of new players entering the market in 2015. As noted a hundred times by now. If you only paid attention to the mainstream media, you’d be forgiven for thinking that the US is going to get away from the collapse in oil prices scot free. According to popular belief, America is even going to be a net winner from cheaper oil prices, because they will act like a tax cut for US consumers. Or so we are told. In reality, though, many of the jobs the US energy boom has created in the last few years are now at risk, and their loss could drag the economy into a recession. The view that cheaper oil automatically boosts US GDP is overly simplistic. It assumes that US consumers will spend the money they save at the pump on US-made goods rather than imports. And it assumes consumers won’t save some of this windfall rather than spending it. Those are shaky enough. But the story that cheap fuel for our cars is good for us is also based on an even more dangerous assumption: that the price of oil won’t fall far enough to wipe out the US shale sector, or at least seriously impact the volume of US oil production. The nightmare for the US oil industry is that the only way that the market mechanism can eliminate the global oil glut—without a formal agreement between OPEC, Russia, and other producers to cut production—is if the price of oil falls below the “cash cost” of production, i.e., it reaches the price at which oil companies lose money on every single barrel they produce. If oil doesn’t sink below the cash cost of production, then we’ll have more of what we’re seeing now. US shale producers, like oil companies the world over, are only going to continue to add to the global oil glut—now running at 2-4 million barrels per day—by keeping their existing wells going full tilt. True, oil would have to fall even further if it’s going to rebalance the oil market by bankrupting the world’s most marginal producers. But that’s what’s bound to happen if the oversupply continues. And because North American shale producers have relatively high cash costs (in the $30 range), the Saudis could very well succeed in making a big portion of US and Canadian oil production disappear, if they are determined to. In this scenario, the US is clearly headed for a recession, because the US owes nearly all the jobs that have been created in the last few years to the shale boom. All those related jobs in equipment, manufacturing, and transportation are also at stake. It’s no accident that all new jobs created since June 2009 have been in the five shale states, with Texas home to 40% of them. More people were unemployed in France in November than ever before, data showed on Wednesday, highlighting continued weak activity in the eurozone’s second-largest economy. The Labour Ministry said the jobless total in mainland France rose by 27,400 to 3.49m in November, a 0.8pc% increase over one month and 5.8pc over one year. The rise was sharpest among unemployed aged 50 or over, up 11pc on the year. President Francois Hollande has seen his popularity fall to the lowest ratings in French polling history, with a key factor being his failure to live up to promises to tackle unemployment. The jobless increase in November was the third monthly gain in a row after a slight fall in unemployment in August. The French government had been counting on a pick-up in business activity in the second half but has cut its 2014 economic growth estimate to 0.4pc from 1pc previously after the economy stagnated in the first half. Data on Tuesday showed a slight rebound in consumer spending in November while the government confirmed its estimate of GDP growth at just 0.3pc in the third quarter of the year. Remember when nobody wanted to touch U.S. subprime-mortgage debt? That’s just a distant memory as it delivers some of the bond market’s best returns. The securities that were created in the years before the financial crisis in 2008, which marked the last time they were issued, have gained almost 12% this year, or six times more than junk-rated corporate debt, according to Barclays Plc. After contributing to the collapse of Lehman Brothers Holdings Inc., bonds tied to the riskiest home loans have returned 75% since 2010, topping speculative-grade corporate debt for three straight years. “A lot of the uncertainty around the asset class has been taken away,” Tom Sontag, a money manager at Neuberger Berman Group LLC, which oversees about $250 billion, said by telephone from Chicago. While almost 30% of the subprime mortgages tied to bonds are at least 60 days delinquent, the %age has fallen from as much as 41% in 2010, data compiled by Bloomberg show. In the broader market for mortgage securities without government backing, which also includes loans known as Alt-A and jumbo debt, the default rate has fallen to 23% from 30% in 2010. “It’s going away, there’s a dedicated buyer base and there’s strong fundamentals,” said Carl Bell, the Durham, North Carolina-based deputy chief investment officer at Amundi Smith Breeden, the U.S. unit of the money manager that oversees more than $1 trillion globally. What could go wrong? Oh apart from FHFA’s Mel Watt enabling 3% downpayments and subsidized homes for the poor and needy… Four words – It’s different this time. Running out of women and children to squeeze dry? George Osborne’s hopes of using a strengthening economy as the springboard for victory in the general election next May have been dealt a double blow with news of weaker growth during 2013 and 2014 and one of the biggest current account deficits in the UK’s history. With Britain’s recovery from its worst ever recession set to dominate a tightly fought vote next spring, Labour seized on official figures showing it was unlikely that national output would expand this year by the 3% envisaged by the chancellor in the autumn statement. Osborne has claimed in recent weeks that a combination of stronger growth, falling unemployment and a smaller budget deficit have shown that the government’s plan is working and that sticking to the current course is essential. But the Office for National Statistics said the economy’s performance through much of 2013 and 2014 had been less impressive than was first thought. It left growth unchanged at 0.7% in the third quarter of 2014, but revised down its estimates for the five previous quarters – cutting the annual growth rate in the year up to the third quarter from 3% to 2.6%. With fresh figures showing America’s economy expanding at an annual rate of 5% in the third quarter, it will now be touch and go whether Britain is the fastest growing of the leading G7 industrial nations in 2014. The data from the ONS added spice to the political battle over economic competence when it said gross domestic product per head – one measure of living standards – was rising, but the 0.6% increase in the third quarter left the measure 1.8% below its pre-recession peak. An alternative measure of national wellbeing – net national disposable income – remained flat in the third quarter and was 5.6% below its pre-recession peak. The measure makes allowances for depreciation and for income generated in the UK that goes to overseas residents. Meanwhile, the UK’s current account – which measures trade in goods and services together with investment income and payments to multinational bodies – was in the red by £27bn in the July to September quarter. At 6% of gross domestic product, the current account deficit is now higher than it was during the so-called Lawson boom at the end of the 1980s, its previous peak. Nice double sided conundrum to have. The Italian government is intervening in the management of Europe’s biggest steel plant, in an attempt to reform the beleaguered business. A commissioner will be appointed to manage the site in Taranto and could have the task of preparing its sale. Ilva, which is a major employer in the southern Italy, has faced criticisms over its environmental record. Toxic emissions from the Ilva plant have been blamed for unusually high rates of cancer in the area. The privately-owned plant, Europe’s biggest in terms of output capacity, employs at least 14,000 people. Ilva has been making a loss for years and was placed in special administration last year. Italy’s Prime Minister Matteo Renzi also committed the government to clearing up the polluted areas surrounding the plant, in order to protect children in Taranto, the coastal town in which Ilva is based. The European Commission said in October that the Tamburi area of the town in particular was contaminated and urged the government to take action. Mr Renzi said that the government would consider nationalising the plant and selling it on, if a buyer could be found who promised to protect jobs. “I forecast maximum state intervention of 36 months to clean up Ilva and relaunch it,” he told reporters. The international steel giant ArcellorMittal has reportedly expressed an interest in acquiring Ilva. The plant, owned by the Riva family, was partially closed in 2012 because of the high levels of pollution. Let’s get this solved once and for all. Russian investigators say they have new proof from a witness that a Ukrainian pilot fired a missile on the day of the Malaysia Airlines crash which killed 298 people, including 38 Australians. The witness, who was not named, worked at an airfield in the Ukrainian city of Dnipropetrovsk where he claimed to have seen a warplane take off on July 17 with air-to-air missiles and return without them. An Investigative Committee statement said the testimony of the man “is important proof that Ukrainian military was implicated in the crash of the Boeing-777”. Flight MH17 from Amsterdam to Kuala Lumpur was shot down over territory in eastern Ukraine controlled by pro-Russian separatists, who have been fighting Kiev forces since April. Ukraine and the West accused Russia of supplying the rebels with a surface-to-air missile launcher, but Russia has issued several opposing theories, one of which involves a Ukrainian military jet allegedly seen next to the passenger jet. The witness was filmed by Russian tabloid Komsomolskaya Pravda with his back to the camera and even the back of his head blurred. He said he saw a Sukhoi-25 jet take off armed with air-to-air rockets and return to the base without them. “[The plane’s operator] could have launched them into the Boeing out of fear or revenge,” the witness said, identifying the pilot of the jet as having the surname Voloshin. “Maybe he mistook it for another plane.” Komsomolskaya Pravda claimed the witness showed up at its office and that his identity checked out but did not identify him because his family was still in Ukraine. The Investigative Committee said the man could be enrolled in a witness protection program. There was no evidence previously that Russian investigators had launched an official probe into the crash, in which citizens from 11 countries died, but no Russians. Dutch authorities have been charged with establishing what brought down the plane and are reconstructing part of the aircraft as part of their probe. Preliminary findings indicate only that the plane broke apart due to damage that came from outside. Health issues. Russians are known for making lethal homebrew. Russian President Vladimir Putin has ordered his government to curb rising vodka prices. Mr Putin, who has been hit by increasing economic woes, said that high prices encouraged the consumption of illegal and possibly unsafe alcohol. Russia’s currency, the rouble, has lost value recently due to falling oil prices and Western sanctions. The country’s former finance minister warned that Russia would enter recession next year. Mr Putin, who promotes a healthy lifestyle, asked “relevant agencies” to think about what he said, adding that the government should fight against the illegal trafficking of alcohol. According to a leading university study last year, 25% of Russian men die before reaching their mid-50s, Reuters reports. Alcohol was found to be a contributing factor in some of these early deaths. Since last year, the government-regulated minimum price of half a litre (17 oz) of vodka has increased by around 30% to 220 roubles ($4.10; £2.64), Reuters adds. It is not just vodka that has seen a price rise. Annual inflation in Russia currently stands at 9.4%. Of course, boomers abroad who want to work part-time or operate a business still have to pay income taxes — even if they live in the Cayman Islands or St. Kitts and Nevis, which have no personal income taxes. “The U.S. is one of the few countries on the planet that taxes its citizens on income no matter where in the world it’s earned, so we file our U.S. taxes every year, as all U.S. citizens must no matter where they live,” Prescher adds. In fact, some 1,000 U.S. citizens and green-card holders gave up their citizenship in the first quarter of this year to avoid taxes and move abroad, even though acquiring citizenship in another country can often be a complex and expensive process. Here are 5 reasons not to retire in Florida, or anywhere else in the U.S. If the social and financial structure around you collapsed tomorrow, as it did for many people during the fall of the Soviet Union, are you prepared to survive and even prosper? In my latest interview with best selling author Dmitry Orlov we discuss lifestyle and how your lifestyle decisions may dramatically impact how your family will fare if times get tough. Dmitry left Russia with his family in 1976 and settled in the Boston area to pursue an education in computer science and linguistics. Along the way Dmitry realized he was trapped in the traditional American pursuit of a career. He was working day and night to make money to pay for the car and city condo and all the trappings of success. He needed the car and condo and all the trappings of business to keep making money. The same vicious cycle most Americans face every day. Well Dmitry gave it all up for a life on a sailboat full of travel and freedom. In our interview, I passed along some of your questions as well as my own to get Dmitry’s perspectives. As you probably know if you follow Dmitry or the ClubOrlov blog, Dmitry brings an interesting perspective to the whole lifestyle and survival dialog. In this interview, Dmitry shares his thoughts on why he believes that Russian citizens were far better prepared for a collapse than the typical American citizen. His logic is sound and it definitely makes you question…. “what would my family do in a collapse, faced with”: No lights, No running water, No flushing toilets, No trash removal, No gas at the gas pumps, No government services, No public transportation Strangely enough, quite inadvertently, the Russian citizens may have been far better off to handle such a collapse, and here is why…..
Supertrawlers will be permanently banned from Australian waters, the federal government announced on Wednesday. The move follows the temporary bans on supertrawlers imposed by the Labor government two years ago and re-endorsed by Tony Abbott in March. The first ban expired in November and the second was up for review in April. The parliamentary secretary for agriculture, Richard Colbeck, said the government would stop vessels longer than 130m from fishing in Australian waters. This definition of supertrawler does not take into account the processing capacity of a vessel, which proponents of the ban say is just as critical as the size of the vessel. “This government will introduce regulations under the Fisheries Management Act to give effect to this decision,” Colbeck said in a statement released on Wednesday afternoon. “This decision will have policy effect immediately.” Colbeck said the government “has consulted widely and accepts the legitimate concerns of many in the community, including those involved in recreational and commercial fishing”. “The government is determined that Australian fisheries management remain among the best in the world,” the statement said. Labor banned supertrawlers, or large freezer-factory vessels, after outcry from the public. The Stop the Supertrawler petition has nearly 63,000 signatures. Green is turning dark grey in Germany. Germans have welcomed solar panels glinting on their rooftops and windmills looming over their fields, and they have even put up with a doubling of their electric bills. But enthusiasm for all things green appears to have reached a limit with a plan to string high-voltage transmission lines along the outskirts of cities like Fulda in the center of the country. Dozens of protest groups have sprung up over the past year along the 500-mile path of the project, SuedLink, one of four high-voltage direct current lines that are to carry wind-generated power from north to south. The lines are described as essential to the success of the country’s pivot away from nuclear and coal power and toward mostly renewable energy. But nearly a year into the plans, the SuedLink project has set off an outbreak of not-in-my-backyard syndrome that threatens to disrupt a linchpin of Germany’s commitment to a lower-carbon future. People like Johannes Lange, who said he had supported Germany’s green efforts for decades, have sprung into action. “I have been following energy policy for 30 years and have gone along with everything,” said Mr. Lange, a self-employed music teacher from Fulda’s eastern Kämmerzell district. “The moment that I heard they wanted to build this behind my house, I thought, enough!” Germany has embraced environmental protection policies since the 1970s, and has been a leader in efforts to move away from fossil fuels toward an energy system that will reduce its carbon emissions — its contribution to a global effort to slow the rise in temperatures that scientists say is already affecting the planet. Businesses have been wary of the growing costs that the policies have imposed on them, but citizens have been largely stoic. They have protested when the government seemed to waver in its commitment, even as the cost of power for an average family of three has climbed to €85 a month, about $103, from €41 since 2000, according to government statistics. Great story from the director of Joyeux Noël. Memories of World War One can be seen everywhere in the quiet part of the Artois region in northern France where I was born. The war left a trail of cemeteries with well-tended lawns in the midst of fields. Crops now grow around the edges of these spaces where 20-year-old kids from Australia, New Zealand, Canada, Great Britain and other countries lie. Forty nations buried their sons in the earth of my homeland. While still a kid, I learnt the names and flags of these countries. I was able to revise my geography while learning about the history of this war. Every autumn, my father and I collected artillery shells which had been brought to the surface by ploughing. We carried them in our arms and laid them down at the entrance to our fields. A Renault 4 from the Prefecture came to load them up like potatoes and spirit them away. Researchers have estimated that the earth will continue to give its own unique account of the Great War for a further seven centuries. Every year, kids still try to unscrew these shells covered in dirt and rust to see what is inside. As a result, they lose a hand, their eyesight or even their lives. The survivors of these unplanned explosions are treated as “war casualties” and receive a pension based on 1914 rates and converted into today’s euros. Every 11 November, my schoolmates and I sang the Marseillaise under the icy stare of a statue infantryman perched on a column engraved with names, each of which we had to read out loud. None of the houses we inhabited were built before the 1920s and none of our furniture pre-dated that decade. Our grandmothers’ wardrobes were no more. Sometimes, one of these houses would subside as it was built over an old tunnel dug by soldiers. These incidents were treated as war damage and the family was granted government compensation. 1914-1918 was more than just a date written in my school exercise book. It provided the backdrop to my childhood. I later realised that this war was the most important event of the 20th Century. It carried the seeds of the next war while heralding the Soviet era and American hegemony since Europe had pressed the self-destruct button. In 1992, I learned from Yves Buffetaut’s book, Battles of Flanders and Artois, that enemy soldiers on opposing sides fraternised with each other over the Christmas period of 1914. I read that some French soldiers applauded a Bavarian tenor, their enemy a German, on Christmas Eve while others played football with the Germans the next day.